Really you should just head over to Petrona Remembered and read Laura Root’s review of the book which prompted me to immediately seek out my library’s copy. All I really need to say in addition is: ditto. But I can’t quite stop there because I need to tell you that THE EARTH HUMS IN B FLAT is a gorgeous, poignant, novel that is very, very difficult to put down. It’s set in a small Welsh village in the late 1950’s and its sensibility is derived from the fact its first-person narrator is a 12 year old girl, Gwenni Morgan, who believes she can fly, is easily nauseated due to having ‘the family stomach’ and is wary of the Toby Jugs which watch her family’s every move from their high shelf in the kitchen. Gwenni recounts the events surrounding the disappearance of a local shepherd whose two daughters Gwenni often looks after and whose wife, the local teacher, Gwenni likes very much. Gwenni’s voice is perfect. She doesn’t know more or less than a child of that age ought to she merely reports things as she sees or hears them in a way that makes sense to her. And while an adult reader can sometimes see an alternate interpretation of what Gwenni has experienced that really doesn’t matter because the point – the heart – of the book is that we become engrossed in Gwenni’s story and her search for a truth she can understand. One that isn’t wrapped up in the misdirection and half-truths that adults seem to live with. Strachan, through Gwenni, shows just how many ways secrets can be damaging to those who keep them and those who they are kept from as she reveals the layers of secrecy the villagers are hiding. There are some truly sad moments in THE EARTH HUMS IN B FLAT but there is a light humour to offset the melancholy. Seeing things through Gwenni’s eyes can be funny as she talks about the village residents in what is presumably the way she has heard adults do (for example two Jones women are forever differentiated as Mrs Sergeant Jones and Mrs Jones the Butcher) and can’t see what is so enviable about the local woman who wears everywhere what her mother calls a fox-fur but what Gwenni thinks of as a dead animal in need of a decent burial. I think in the end I probably smiled just as many times as I surreptitiously wiped away a tear. 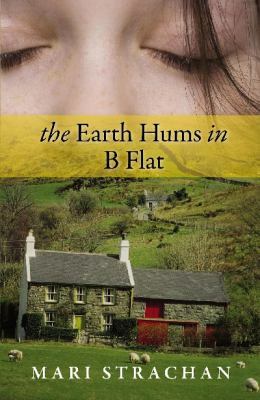 THE EARTH HUMS IN B FLAT is only a crime novel if your definition is a broad one but whatever label you give it the novel is definitely worth tracking down. I can’t imagine anyone who won’t be smitten by Gwenni’s mixture of practicality and naivety and the picture she paints of life in a small Welsh village. I borrowed my copy from the library but as soon as my monthly audible credits arrive in my account I’m going to buy this audio version and ‘read’ it again (not least because the narrator will presumably pronounce all those odd-looking Welsh names for me). My favourite read of the year so far. If you’ve got a favourite crime novel that you’d like to inspire others to read do submit a review, an ode, a love letter or some other form of homage to it at Petrona Remembered just like Laura did. This entry was posted in book review, Mari Strachan, Wales. Bookmark the permalink. Bernadette – You and Laura have sold me. I will definitely have to read this. Even the title is terrific, as is your review. You know, I noticed that too Bernadette. A refereshing change in my opinion. Wow! I have this on order from the library. I’m glad you liked it. What a nice review. Although I just finished Cath Staincliffe’s Split Second and want a break from tearing up, I will put this one high up on my TBR list and hope my library gets it in soon. As it’s an older book there might be more hope your library has it Kathy – mine is usually better for books 1-5 years old than current ones. This is a different kind of tearing up than Split Second – there’s much more humour here…but still emotional in its way. Library: no luck. However, I bought it for $4 from Abe Books used, why not? This sounds so good, has gone on my “to read ‘ list, will see if my library has it. Thanks for the recommendation and so nice to hear about something a bit different. I’m enjoying this book. It’s been a distraction from the horrors in Boston. I can’t wait to see what Gwenni Morgan is saying and doing next, and I know that her character will be one I miss after the last page is turned. I’m already thinking about to whom I can pass the book who will appreciate it. Who would have thought a 12-year-old girl in 1950s Wales would be so winning? I now know it. Thanks to Mari Strachan for creating this character and writing such a charming book.